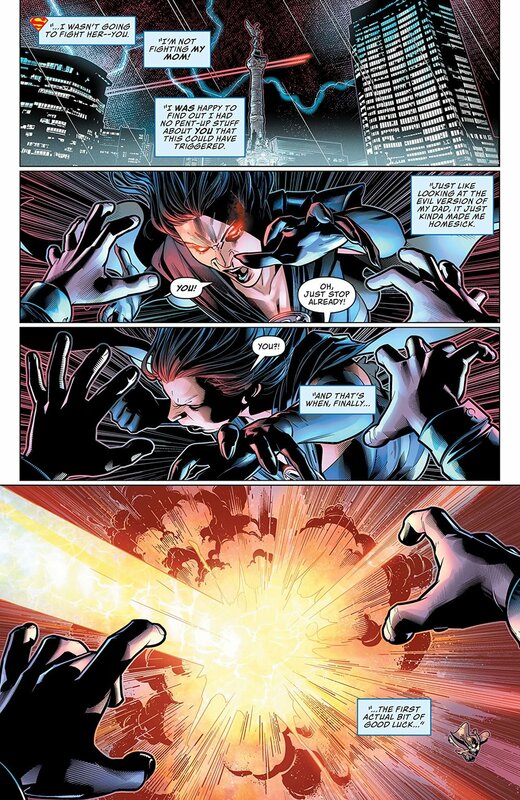 Jon concludes his tale in Superman #10, by writer Brian Michael Bendis, artists Ivan Reis and Brandon Peterson, inkers Oclair Albert and Joe Prado, colorist Alex Sinclair, and letterer Josh Reed. After the last issue reached peak Bendis, this one is a vast improvement. Jon tells his parent about how he escaped Superwoman on Earth-3… Jor-El saved him. Jor-So reveals that he has been looking for Jon through time and space for years. Jon freaks out and demands to go home when a familiar villain attacks Jor-El's ship. Jor-El is able to get Jon home. Superman decides to take Jon and look for his father, and they find his craft- in the middle of a massive, multi-sided battle. While this issue does a lot of same talky, Bendis info dumps that the last chapter did, the ones in this issue actually relate to the plot and the events more closely, it's not just Jon talking about Ultraman. Readers learn why and how Jon got not only thrown to Earth-3 but back in time. This actually gives a reason for the CSA to be alive and isn't just an example of Bendis ignoring previous continuity, which a lot of readers were expecting. 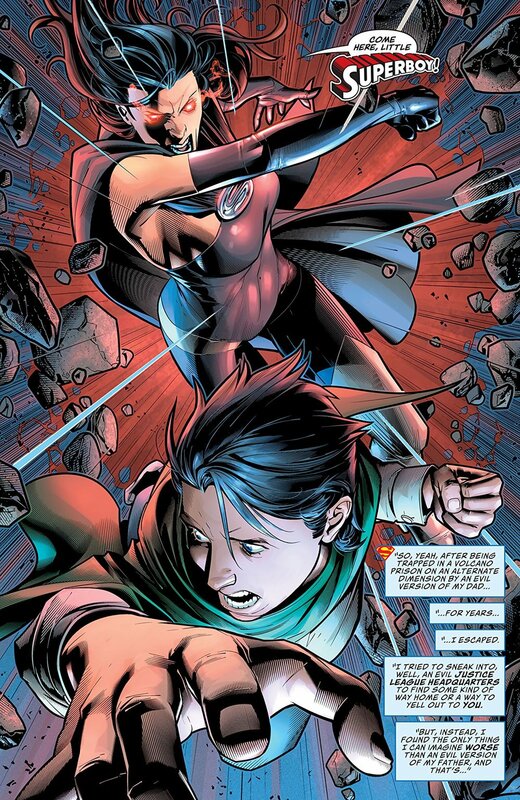 The book starts off with a big chase scene between Jon and Superwoman, which is short but very done well. The attack on Jor-El's ship comes out of nowhere, and while some fans may not care for who did it, it's certainly unexpected and adds an extra dimension to this story. For fans worried about Bendis darkening Jon up, this one puts the kibosh on that. The Jon in this book has gone through a rather terrible trauma, but it hasn't hardened him and made him bitter. In a lot of ways, he's still the character he was- an exuberant kid. It, of course, remains to be seen if Bendis will keep it this way, but Jon deals with things in this issue that a darker character would have dealt with differently. Brandon Peterson slays it on the art. His line work is clean and meticulous, and the opening chase scene wouldn't be nearly as great if he weren't drawing it. His character acting is powerful and expressive as well, selling what's happening on the page perfectly. Ivan Reis’ work seems a little sketchy at some spots in the book, but he makes up for it with a classic Ivan Reis spread of a massive battle in space. Superman #10 is probably the best of this story arc so far. Bendis is able to craft a narrative that plays to his strengths in precisely the right way. It never gets bogged down by all the dialogue because none of it is superfluous or boring. Peterson's art is stellar, and while Reis has some sporty pages, the last big page is fantastic. This issue takes the story in a bit of a new direction, which hopefully Bendis can pull off. It isn't perfect, but this one is an enjoyable read.